If you follow Picture Polish on social media of any sort then you are probably now aware that Jules, one of the girls behind Picture Polish used to be a chronic nail biter. To her amazing credit, she has ditched he habit and she how sports some great nails which she can paint in any of their nearly 100 nail polish shades. You can see a before and after of Jules nails here, which is sure to provide some inspiration to any other nail biters out there. 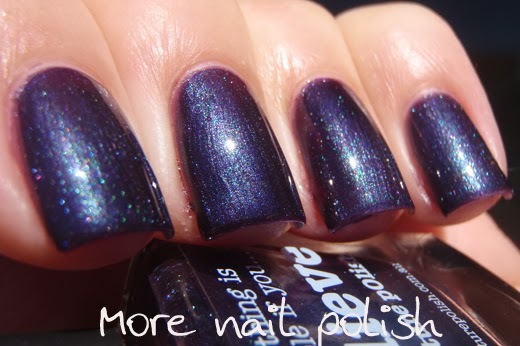 To celebrate her achievement, Picture Polish have released a collection of three "inspire" shades. I have swatches of all three shades, plus a bit of nail art created using two of the colours. 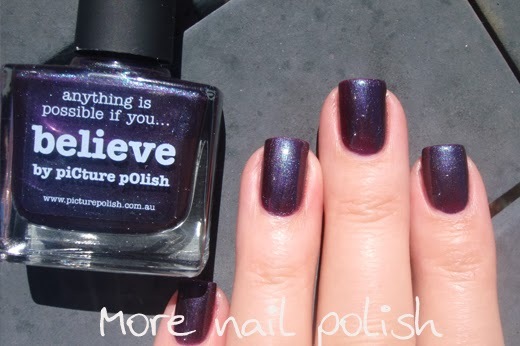 Believe - a dark eggplant purple with a strong blue shimmer. Dark and mysterious indoors, and sparkly in the sun. This is two coats with Seche Vite top coat. 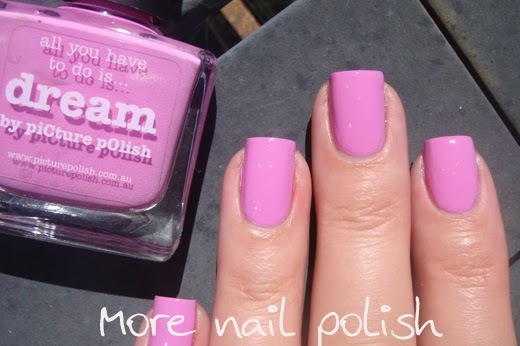 Dream - classic Barbie pink creme. Smooth application and a classic flattering pink that anyone could wear. This is two coats with seche vite top coat. 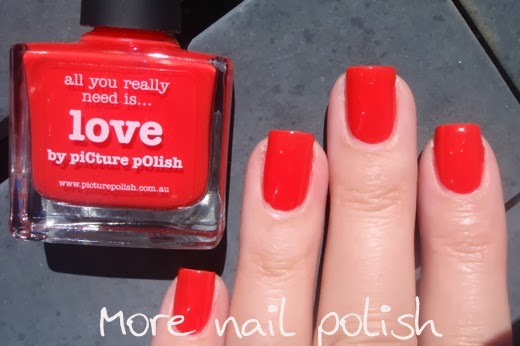 Love - uber bright tomato red creme. I was only thinking the other day that the Picture Polish range lacked a classic red creme, and now here it is. Great formula an easy to apply cleanly on your nails. This is two coats with seche vite top coat. Here is the nail art I created. I started with a white base and then did lots of dots in different sizes using both Love and Dream. Once that was dry, I stamped in Konad black with Messy Mansion plate MM20. These inspire shades, as well as all the other Picture Polish shades are available directly from Picture Polish in Australia, or through their network members around the world. I love your final mani! I never thought of creating a base like that for stamping before. It looks great! Very clever - simple and yet so complex in appearance. Oh my stars! 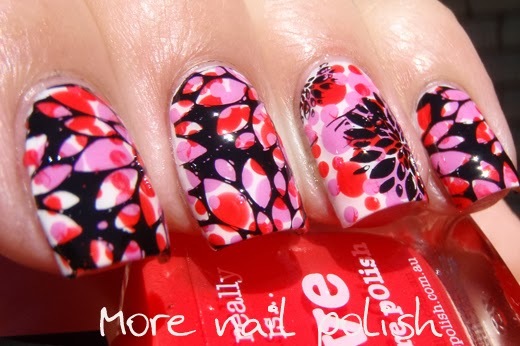 That nail art is beyond awesome!! That red is gorgeous, I love it! 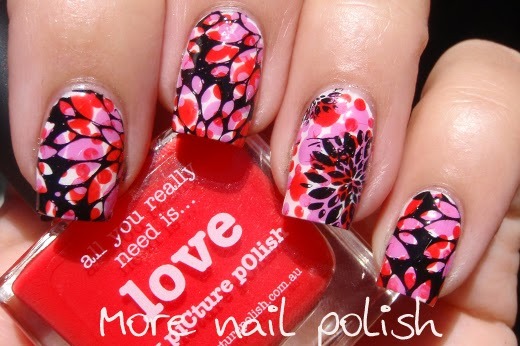 That flower mani is incredible! !